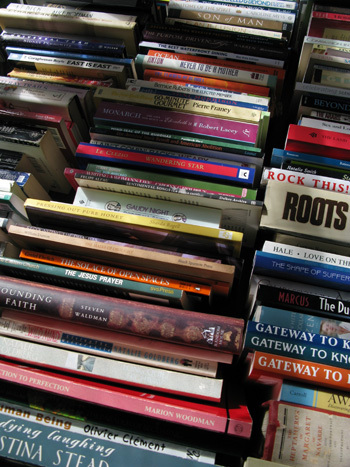 Twice a year Zen Center holds a book sale, the profits of which are used to send Buddhist books to prisoners. We are currently in contact with over 200 prisoners throughout the country to whom we make the written dharma available at no cost. Bring donations for the sale before June 29. Please limit your donations to books in good condition that have resale appeal. We can�t accept magazines, DVDs, CDs, or specialized books with a very limited pool of readers. Bring books on any subject that you’ve enjoyed, would like to read, or would give to a friend. Deliveries can be brought to Zen Center at any time. Come and browse and buy. The prices are great and every purchase helps to bring Buddhism into prisons nation-wide. Consider becoming a prison pen pal. There is an ongoing need for practitioners to reach out to Buddhist prisoners. This is one of the easiest ways you�ll ever find to make a profound difference in another person�s life. If you would like more information about this program, please contact Outreach Coordinator Jeffrey Schneider at either outreach@sfzc.org or 415.354.0379.